Why choose Genuine Honda accessories? Honda is synonymous with quality and performance. 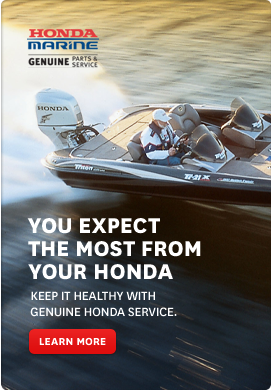 Whether you own a vehicle, motorcycle, ATV, or a product from our power equipment or marine line-ups, chances are you bought the Honda based on our reputation. Genuine Honda accessories are no different. In fact, they are the only accessories that have been approved by the engineers who originally designed your Honda. This helps to ensure that not only will they perform as they were designed to, but they'll fit right too. A wide variety of attachments and accessories are available for your Honda Marine outboard engine. From propellers to protective covers, chances are we've got what you're looking for. Your Honda dealer is the place to go to make your choice. Genuine Honda Oil is specially formulated to provide the best protection for your Honda outboard engine under the most severe conditions. Specially formulated and blended for four-stroke outboard engines. Contact your local Honda Marine dealer to schedule your next seasonal tune-up.